Weekly Wellness Tip: Egg-citing news! Eggs are really good for you. EGG-CITING NEWS! EGGS ARE REALLY GOOD FOR YOU. Worried about the cholesterol in eggs? No need to worry; eggs are EGGCELLENT for you. New research has shown that dietary cholesterol in eggs does not impact heart disease risk. 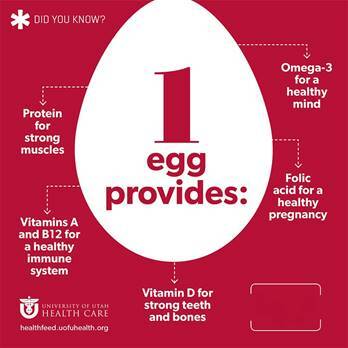 One large egg has 13 essential vitamins and minerals along with 6 grams of high quality protein. Just one egg contains all of the nine essential amino acids that we need to solely obtain from food. Scrambled, poached, or hard boiled- you are providing your body with the nutrients it needs! TIP: Want to make the perfect scrambled egg? Check out Alton Brown's method for a light and fluffy egg from the Food Network.